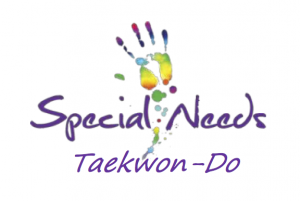 What is Special Needs Tae Kwon Do? It is a modern approach to teaching a traditional art form that embraces our special needs community, opening the door to opportunities and life lessons that have previously been unavailable. By using a modified curriculum and teaching approach, students with a variety of learning styles and abilities are able to progress at their own pace while benefiting socially from a group setting. Through dynamic martial arts exercises, drills and games, our instructors, with the help of dedicated volunteer students, leads groups with a variety of physical, intellectual and developmental disabilities through classes structured to increase coordination, focus, body awareness and social skills. Contact us now to book your trial block.